i got the following email, which i will quote here in its entirety, from a jamaican student in my class at brown. she overheard another student express an interest in writing a final paper about damian marley, and she clearly became incensed by what she perceived as a misperception of what he represents in jamaica. mind you that these are rather strong opinions and not necessarily wholly representative of any social group inna JA--when recently in kingston I observed a group of young men, of various social backgrounds, really enjoying "welcome to jamrock"--but still these sentiments are significant, i think. they do lay out a certain structure of interpretation of marley and his family in jamaica, one very informed by racial politics and enduring class differences and contradictions. note, for example, the "ghetto youths" billboard in the background of the video: does this sort of thing serve to mobilize young blacks in jamaica for some sort of productive politics, or does it serve to appropriate/exploit a romanticized image of ghetto sufferahs in order to sell records and wrist-bands to consumers overseas? one beer, one people. you see me? It's amazing that Damian Marley has come to signify dancehall/reggae. Even more so because looking at him one sees the image of every brown boy who went to Hillel (he went to Hillel) or George's, if they had Bob Nesta for their father and a slew of brothers producing them. Even the person of no relation, Alex Marley, has claimed Bob as his ancestral roots and now has dreaded his hair, eats ital and cusses bout Burger King and screams jah rastafari whenever a rasta man walks by his window. Almost every brown boy wants to be a rasta. The rasta colour wristbands, the weed, the Bob Marley playing, the claim that ol-pirates-came-to-rob-I-and-took-my-homework...some even venture into the ghettos to prove they're the big man, like they're on the same level of the people or understand the level. No one screams about babylon more than a brown boy, not even Capleton. It's a part of their sentence structure. Everything from that babylon teacha deh and the babylon school, the system, mi parents, the prime minister, Omar Davis, the police (Reneto Adams) and now the ever popular University of the West Indies all fall under babylon. They've novelised the inquities of the system in such a way, they scream police brutality as soon as it comes on the news and how dem can't tek dis place ya, then they go to a party, listen some Bob and everything is now all right. Amazing. These are the people Damian went to school with. These are some of the people chilling with him on tour, that he hangs out with. I dare you to take a survey [in Jamaica] and ask any brown boy if his father was Bob Marley if he would "carry on his father's work" and the answer would be yes. They would go bun a babylon. So when Damian Marley came out with albums, it wasn't much of a surprise that he was doing it, it was one because he actually decided to take time out of his busy schedule of pushing the Marley name at anything mawga with some legs, to do an album. We can just say every Marley kid has entered music, it's their job. This culture--if it can be called that--is so pronounced that after watching a documentary on Bob Marley, the females of the class [in Jamaica] all came up with the conclusion: Bob was a brown boy. The way he spoke, the frass weeded look on his face, the constant righteous terminology, the anger towards the government, all typical of a brown boy. But what I believe is, they have all fashioned themselves to fit his mold. Sometimes you wonder what they're so upset about. "The system" their parents are a part of? The car they stole out and crashed and got punished for? The party/session they went to, and the brave occasional venture to passa passa? They embrace dancehall and reggae, putting Beres Hammond and Bounty on the same dub plate and a joke between my female class was that where we gonna find a man if all the men them a start sounds. That's basically the new occupation of a brown boy whose parents wouldn't disown him for not getting an education and going to medicine/law school. So it's hard for me to think that Damian doesn't fit the mold. Forming himself into every sterotype just put forth about a brown boy. This is not to say that his music doesn't have purpose and that people won't be playing it. Even that the Jamaican people are going to reject it. Look at "Welcome to JamRock." He has accomplish what brown boys want to do for a living. He just has more help, being backed by his brothers, Bob's money, Cindy (smart woman) and a whole slew of supportive brown boys. And only time will tell if he's genuine, maybe he really does want to represent the poor and this isn't a "cool" thing to do for him. Maybe it was and he realised that it shouldn't be. My brother was a brown boy. Went to Wolmer. Played Bob at the top of his stereo so you could hear it down the road. Friends ranged from other brown boys to boys in the ghetto. He constantly complained about babylon. And if you ask his son who daddy wants you to meet but you can't, he's 5 and he'll tell you Bob Marley. And no one can tell me if he was the child of Bob that he wouldn't be making music like Damian. But everything righteous doesn't come from righteousness, some of it comes from fad. The very fact Kymani had a number 1 song in hawaii for 6 months straight is just wow. So Damian Marley affecting anyone that greatly is not surprising, it's just amazing. And if anyone just loves him to death, they should find themselves a brown boy. Because you'll hear a lot of what he says coming out of their months except the really deep spiritual thing stuff which they haven't uncovered yet. I'm not saying that Damian isn't an artist or that he should discredited. But to understand him you have to understand the brown boy mentality which is prevalent in middle class to rich Jamaican boys. 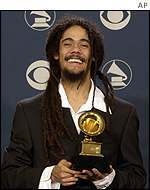 Most disturbing thing heard when I said, "Damian Marley doesn't respect woman," is to hear "Bob was a womanizer." The only answer that came to my head was Bob was woman beater, so I guess it's okay for Damian to be one too. (not making allegations, just stating a followup argument). Disturbing. not so sure bob or his son damian is a womanizer or abuser. it states that only time will tell if he's genuine...what..when he makes money and becomes rich he won't support/represent the poor? He is rich and never needed to work to be rich...This marley family legacy is real. Damian is one of the headliners. Before any criticism is placed on those who are doing much to create the best contemporary reggae music let us examine how the rest of the reggae community lacking the name marley fails to eqqual its' greatness. thanks for your comment. i agree that there are also good things to be said about what damian is doing. and the last thing i want to do is simply slander the marley family. in an attempt to balance the rather one-sided critique above, i've created a follow-up post that attempts to weigh in more carefully, recognizing the validity of my student's reaction as well as the positive possibilities opened up by the success of the song. I relate well to this students email. I am accused of carrying the same controversial chip on my shoulder regarding another jamacian born art form that has since been perfected in the streets of America. I grew up in third world conditions right on American Soil. Some of my time was spent in section 8, some of it was spent in houses without running water, heat, or food on the outskirts of what I have come to call suburban sprawl. When my mother finally lost her home to a forced tax sale, my brothers and I began to drift, from couch to independence, to homelessness again. All in the land of opporunity, where I should be able to pull myself up by my bootstraps -tell me, have you ever applied for federal financial aid for college wihtout a permanent address?- Throughout this life of mine the soundtrack has been provided by what the Jamacians call toasting, and what the Americans call hip hop. It is a youthful culture, bred from opposition and a genuine sense of persecution, an outlet for a certain type of anger that not all have the displeasure of knowing. It is sometimes the only form of empowerement granted when you feel you have no wordly power. After all it has given me why have I come to hate hip hop and the men that are touted as its heros? Well, I am a white woman. I don't fit the mold, and I have a bad taste in my mouth from all the people I have encountered in my life who are posing with ease in a posture that has left my muscles taut and aching. From MCs to college students, to the millitant middle class soldiers in an imaginary war...they will proudly rage against a machine that has afforded them countless opportunities that even my extended white privlege will not give me. White people have not done anything for me lately, either has chuck D, so skip the post-modernist critique, class trumps race. So, after years of listening to young black men who grew up in two income households and young white men who knotted up their hair even if their neurosurgeon fathers didn't like it, tell me how they are down for a cause, how they embody hip hop culture and not knowing all along that I am the "American Experience" that bred it...I realized its all a fraud. Every MC I have ever met has turned out to be a womanizing hyprocrite, countless of them have made my life miserable, and the culture has become a marketing tool that all these "wanna be down" pseudo-intellectuals and fake thugs buy into to continue to make the machine richer and richer. Just remember the music, the sound of the oppressed, the image that they perfect, it is all capable of becoming a product and IT makes money, not the people it was originally intended to inspire. We get left behind, and feel betrayed when we see our struggles paraded before us as a fashion statement, a "movement" AKA a way for other people to "fit in". Its no longer a representation of who I am. Its tainted, like regaee, jazz, blues, and just about everything that becomes indicative of a generations resistance. For God's Sake Bob Dylan is doing Victoria's Secret commercials...do not doubt the validity of your students comments. If you are looking for heros this world has not seen any -that don't eventually become treasonous- in a long time. If you are a woman, to support your student again, I always say "Even Bob Marley, MLK Jr., and Gandhi cheated on or beat their wives, so don't get your hopes up." I believe that we can all agree that young Damian would be honored to follow in his fathers vision. I believe it would be a vlauable piece of fact to have bob marleys of the vision he passed on to his children. Was bob a man of character. I mean were the people who are dear to him inspired by his being a part of his life. Can they speak of his character. What about their mother. What are the values that she passed on to them. The Marley children are a valuable part of our culture. I believe we all have choices in how we want others to see us. But we must also remember that there is always people sharing one body. Did Bob Marley do what he said, is he a man of character. And I believe that if he was the example that his sons looked up to, great! But the Marley culture have now passed on to a new generation a culture of choice. We, if we are the ones who "know the truth about..." have the choice to be real influence. They are entertainers, that is their profession. Of course marketing will be a factor in their lives. Of course hip hop would become a marketing tool to make money. But let us put on our thinking breaks and ask ourselves, are we not more of an influence on the people in our lives. We all have struggles in our lives, that's what makes life so interesting. Bob Marley was a great entertainer, Micheal Jackson was a great entertainer, Erica Badhu is a great entertainers. If we focus on what entertainment says and does, we may become as frustrated as the message that we complain about. Lets enjoy the music. If we want people of character to entertain us, let us choose that. As long as we realize that we build a relationship with these people. If you do not want your children to be influenced by these people, we become a better influence to our children. Be the character we want our sons and daughters to be. It takes effort, but we all can do it! When I tell my son about "Brown boys" I will tell also about a great song by Tanya stevens "to the limit". she/he will understand the value of a persons character. Then they can who to listen to, who to hear, and who to follow. We all have this duty. Bob Marley may be the image of a culture. Martin Luther King Jr. May have been leaders of their culture. We all need heros, but we all have the the power and excercise it daily, to be a person people want to follow, and who we choose to follow.